Vintage rings are timeless, unique pieces that often have far more character than modern rings. Vintage pieces have the potential to become heirlooms passed down for generations. Even if there is not an heirloom ring in your family, purchasing an estate ring is an option, as is selecting a new ring made in a vintage style. 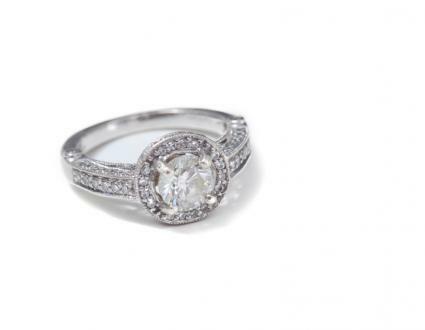 The best places to look for vintage engagement rings are with antique dealers specializing in vintage jewelry. Check with antique stores in your local area as well as online resources. Antique Jewelry Mall - You can find just about every vintage style ring setting at the Antique Jewelry Mall. Most are complete rings, though you can sometimes find settings for sale that you can have a new stone or one you already have mounted in. Details such as karat weigh, clarity, cut and more are provided about each piece. Ring sizing is available. Trumpet & Horn - This site offers a variety of vintage engagement rings at the higher end of the price spectrum, with prices starting around $3,000. Brilliant Earth - This company carries an impressive collection of vintage rings dating back to the 1920s. You can view comprehensive details on the design and stone quality of each piece via the website. Lee Jay Nacht - This company specializes in antique engagement rings, carrying styles first created from the 1910 through 1949. The company also creates replica rings based on vintage styles. Prices for vintage rings vary greatly, with some styles that have small stones selling for less than $1,000 while others may go up into the six-figure range. You should be aware that the price of vintage rings often exceeds the cost of similar karat-weight new rings. That is because the value lies not only with the diamonds, gemstones and metal in the ring, but also with its antique value. It's also important to be aware that it can take some time to find a quality vintage piece that you love. Although vintage engagement rings are as varied as modern ring settings, there are several common styles. Victorian - Jewelry designs during the Victorian era varied widely. Most Victorian engagement rings were made out of yellow gold or rose gold. Since mining diamonds were extremely scarce during this time period, Victorian style engagement rings often had other precious gemstones surrounded by smaller diamonds. 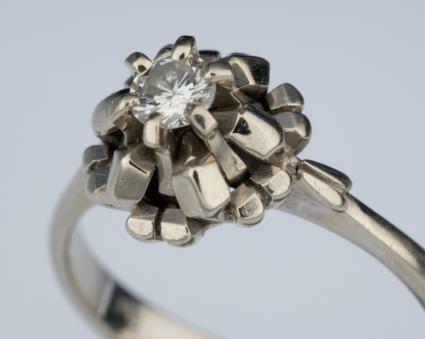 Edwardian - If you are looking for an Edwardian engagement ring, the metal must be platinum (though white gold is a great substitution and far less expensive). The settings were often intricate and highly detailed. The diamonds placed in the Edwardian settings were generally rose cut diamonds. Art Deco - During this time period, ring settings became simpler than during the previous era of fancy filigree and intricate lace patterns. Asscher, emerald and marquis cut diamonds were most popular for Art Deco engagement rings. Because jewelers of the past didn't have access to the precise technology available today, they had to develop the art of cutting each stone. Because of the cruder technology, many truly vintage and antique stones will have chips, scratches, or flaws along the edges or surfaces of the facets. While these flaws may devalue the piece slightly, that depreciation is often countered by the intricacy and age of the ring. Platinum wasn't used extensively in engagement rings until the beginning of the 1900s. Until then, yellow gold was the most prominent metal. In the early twentieth century, platinum engagement rings became popular, but as wars, particularly World War II, demanded platinum for military manufacturing, yellow gold once again regained its popularity. Today, ring purchasers can choose from white gold, yellow gold, and platinum, as well as various combinations. There is more to buying vintage jewelry than visiting an estate sale or local jewelry store. There are several points you need to keep in mind when searching for that perfect ring. Vintage rings are often quite delicate, with intricate patterns and tiny accent stones. Be sure you have the ring examined thoroughly and understand what repairs might be necessary, along with any extra maintenance costs. Older rings often have the accumulated dirt and oils of decades of ring fingers embedded in the prongs, setting, and other miniscule niches of the ring, and thus may not appear as sparkling as they will after a thorough cleaning. Many jewelers should be able to clean the piece upon request, though this service may not be available at pawn shops, estate sales, and auctions. If you are purchasing a gemstone other than a diamond, keep in mind that these stones may be quite a bit softer and more vulnerable to time and everyday wear. Small flaws may be overlooked in favor of the age of the ring. Be sure you have your ring appraised by a reputable jeweler to verify its worth, and insure the piece if necessary. Vintage engagement rings are not made to be worn every day. 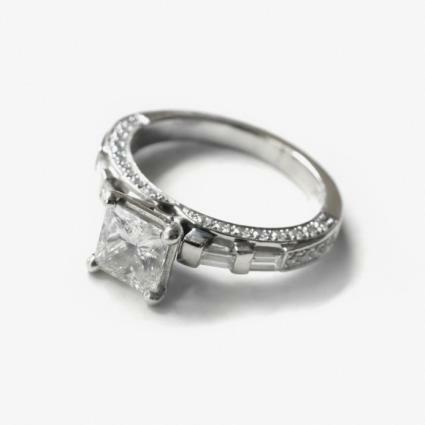 Plan on removing your ring before cleaning, yard work, or sports activities, and always store it in a safe location. The ring should be examined regularly by a jeweler to check for loose settings, bent prongs, or other damage. It should be professionally cleaned as well because modern over-the-counter chemicals may damage older rings. Many jewelers can create the same delicate designs and intricate patterns of vintage engagement rings with new bands and stones. 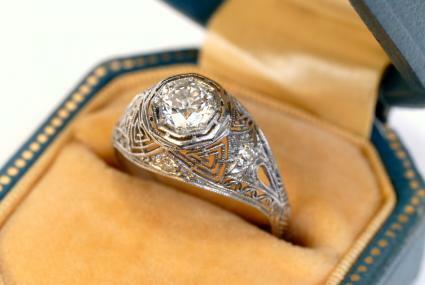 Because modern technology makes this process easier, a "new" vintage ring may be less expensive than a true antique. Furthermore, by designing a new ring, you guarantee the quality of the stones and the durability of the ring, since many settings and metals used today are sturdier than those used previously. Firenze Jewels - This company carries an extensive selection of vintage style settings from which you can choose among. Some are sold as settings only while others are available as complete rings. Options start below $1,300 and go up to approximately $12,000. Ross-Simons - This well-known jeweler carries an impressive selection of vintage style engagement rings at price points starting at under $1,400 and going up to nearly $60,000. The Marlene Harris Collection - This company carries a wide variety of vintage style engagement rings, with options available between $1,000 and $7,000. Rings are made using molds that date back to the Victorian age. 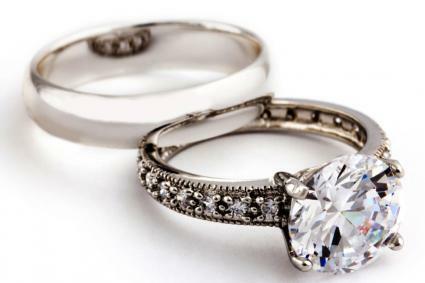 With good care, your vintage ring can last for decades to come. Whether you purchase a true antique or design a new vintage-style ring, you can start a tradition of love that can be handed down to your children and grandchildren.